Teens in Roanoke City are like any other teens. Peer pressure and social media can have a lot of influence on teens, but parents can have even more. According to research, kids are less likely to use marijuana if they know their parents disapprove. Evidence has shown that marijuana use during the teen years could potentially lower a person’s IQ and interfere with other aspects of functioning and well-being. Teens under age 17 who use marijuana every day are 60 percent less likely to graduate from high school, compared with their peers who have never used the drug. Marijuana can increase risk of chronic cough, bronchitis and schizophrenia in vulnerable individuals. It also may increase risk of anxiety, depression and a series of attitude and personality changes. Teens who use marijuana as a coping mechanism can have a difficult time working through emotions as adults. 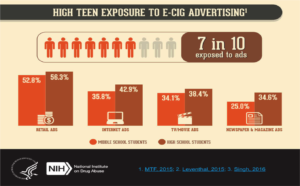 Click on the photo to learn more about preventing teenage use of nicotine. In just the few years since RPA started focusing on reducing drinking and driving, Roanoke has made progress on a very serious and complicated issue. They have the data to back up their work and passion to make it happen.